Protein-protein interactions (PPIs) constitute one of the most crucial conditions to sustain life in living organisms. To study PPI in Arabidopsis thaliana we have developed AtPIN, a database and web interface for searching and building interaction networks based on publicly available protein-protein interaction datasets. All interactions were divided into experimentally demonstrated or predicted. The PPIs in the AtPIN database present a cellular compartment classification (C3) which divides the PPI into 4 classes according to its interaction evidence and subcellular localization. It has been shown in the literature that a pair of genuine interacting proteins are generally expected to have a common cellular role and proteins that have common interaction partners have a high chance of sharing a common function. In AtPIN, due to its integrative profile, the reliability index for a reported PPI can be postulated in terms of the proportion of interaction partners that two proteins have in common. For this, we implement the Functional Similarity Weight (FSW) calculation for all first level interactions present in AtPIN database. In order to identify target proteins of cytosolic glutamyl-tRNA synthetase (Cyt-gluRS) (AT5G26710) we combined two approaches, AtPIN search and yeast two-hybrid screening. Interestingly, the proteins glutamine synthetase (AT5G35630), a disease resistance protein (AT3G50950) and a zinc finger protein (AT5G24930), which has been predicted as target proteins for Cyt-gluRS by AtPIN, were also detected in the experimental screening. AtPIN is a friendly and easy-to-use tool that aggregates information on Arabidopsis thaliana PPIs, ontology, and sub-cellular localization, and might be a useful and reliable strategy to map protein-protein interactions in Arabidopsis. AtPIN can be accessed at http://bioinfo.esalq.usp.br/atpin. Protein-protein interactions (PPIs) constitute one of the most crucial conditions to sustain life in living organisms. Recently, many experimental procedures have been developed to help elucidate the intricate networks of PPIs ranging from high-throughput experiments based on genomic scale analyses [1–4] to molecular biology approaches on a specific key pathway [5–7]. Sometimes the costs (financial and personal) of such exploratory experimental approaches are prohibitive; to circumvent this drawback, the bioinformatics alternative is frequently used as a valuable preliminary step to point to a more specific target, reducing both costs and time. All of the protein-protein interaction information is often made freely available on different public databases with searching tools commonly restricted to one specific data set. However, even using standard formats to exchange data such as Molecular Interaction XML Format (PSI MI XML)) protein nomenclature may differ, impairing comparisons among databases without some protein name conversion. Some authors make use of methodologies such as yeast two-hybrid, mass spectrometry, immunoprecipitation, or fluorescence resonance energy transfer assays to demonstrate protein interactions [9–14]. But, in some cases, protein interaction networks were determined solely by bioinformatics tools [15–18], and were not confirmed by experimental methodologies. In addition, those predictions rarely consider the subcellular localization of the interactors. The function of a protein is governed by its interaction with other proteins inside a cell, but even if two proteins are consistently predicted to interact they must be located at the same cell compartment and at the same time. Arabidopsis thaliana has long been used as a model organism in a wide range of protein function, interactions and mutational studies . Thus, a lot of predicted and curated data is now available on centralized databanks such as TAIR  or throughout scientific literature. In this work, we present the Arabidopsis thaliana Protein Interaction Network (AtPIN), a database that integrates five available interaction data sets and two other databases: SUBA, a subcellular localization database [21, 22] and TAIR gene ontology and annotation . We also generated a web interface to query AtPIN and built the networks in a Cytoscape  easily importing format (XGMML and SIF). One of the AtPIN key points is its integrative profile, queries response encompass experimental and predicted information on the protein interactions as the subcellular location and its database structure flexibility, facilitating the addition of new data sets, as well as additional analyses parameters. AtPIN presents some advantages upon other available systems: it is specific for A. thaliana protein interaction; the scoring system for co-localization; easily integration with Medusa  and Cytoscape  for PPI network visualization and manipulation. We used MySQL http://www.mysql.com/ to build AtPINDB due to its transactional SQL database engine and fastness. AtPINDB integrates more than 96,000 PPIs (96,221 as in release 8) from five public available databases: IntAct [26, 27], BioGRID , Arabidopsis protein-protein interaction data curated from the literature by TAIR curators [20, 29], the Predicted Interactome for Arabidopsis , and the A. thaliana Protein Interactome Database (AtPID) , all of them are queried weekly for updates. The PPIs demonstration methodologies on AtPINDB were divided into two categories: Experimental: This means that the indicated PPI was experimentally demonstrated using Arabidopsis thaliana proteins. Predicted: The indicated PPI was proposed based on ortholog studies. All interaction updates are locally curated, manually and automatically via a homemade set of PERL scripts and performed as follows: 1) If necessary, change the protein identification to TAIR locus name, based on conversion data available at the TAIR website ftp://ftp.arabidopsis.org/home/tair/Proteins/Id_conversions/; 2) update all annotation and gene ontology information to the most current available at TAIR ftp://ftp.arabidopsis.org/home/tair/Ontologies/Gene_Ontology/. 3) update the subcellular information for each locus based on SUBA . 4) update all interactions from databases. Experimentally demonstrated interactions have priority over predicted ones, and once the PPI status is updated its Pubmed links will now represent the direct evidence publication as well as the experimental method used to demonstrate this interaction. 5) Check and update the experiment controlled vocabulary. All experimental data is present in a controlled vocabulary based on the Molecular Interactions from Proteomics Standards Initiative (PSI_MI)) available at http://www.berkeleybop.org/ontologies/obo-all/psi-mi/. 6) Recalculate the cellular compartment classification and FSW as described below. The last class is Unknown: which indicates that there is no available data to calculate the C3 value or the data does not fit onto any class previously described. It is noteworthy that C3 value is an active characterization due to its dependency on experimental data availability of protein interaction as well as subcellular location. Another probability shown by AtPIN is the PEP. This is a Bayesian probabilistic score calculated based on all data available in AtPINDB so, it is dependent on the availability of experimental data. It is represented by two values, first the probability of a particular PPI be experimentally demonstrated once it was predicted, and second, same as state for the first but of both interactors were experimentally co-localized, for the release 8 those values are 2.6% and 9.0% respectively. The PEP value is unique for each AtPINDB release, an updated value is shown at website, and should be used only as a statistical evaluation of AtPINDB. It has been shown in the literature that a pair of genuine interacting proteins are generally expected to have a common cellular role and proteins that have common interaction partners have a high chance of sharing a common function [31–35]. In AtPIN, due to its integrative profile, the reliability index for a reported PPI can be postulated in terms of the proportion of interaction partners that two proteins have in common. Two related mathematical approaches, CD-distance  and FSWeight , have been proposed to assess the reliability of protein interaction data based on the number of common neighbours of two proteins. Both were initially projected to predict protein functions, and lately have been shown to perform well for assessing the reliability of protein interactions . Wong  have shown that using FSWeight, which estimates the strength of functional association, to remove unreliable interactions (low FSWeight) improves the performance of clustering algorithms. The pairs of interacting proteins that are highly ranked by this method are likely to be true positive interacting pairs. Conversely, the pairs of proteins that are lowly ranked are likely to be false positives. The most interesting feature of the CD-distance and FSWeight is that they are able to rank the reliability of an interaction between a pair of proteins using only the topology of the interactions between that pair of proteins and their neighbors within a short radius in a graph network [32, 38]. N avg = Average of interactions made by each protein in AtPINDB. The effectiveness of using FSWeight as a PPI reliability index was demonstrated using 19.452 interactions in yeast obtained from the GRID database , over 80% of the top 10% of protein interactions ranked by FSWeight have a common cellular role and over 90% of them have a common subcellular localization [32, 38]. In AtPIN (release 8 of AtPINDB), using the same top 10% of protein interactions ranked by FSWeight, we show that 59% PPIs share the same sub-cellular compartment and 83% have the same function or participate in the same cellular process. A good FSWeight value threshold starting point is the top 20%, since Chua  and Chen  have demonstrated that a protein pair having a high FSWeight value, above this value, are likely to share a common function. We have made available on the AtPIN website a table with live calculation of top ranked FSWeight values ranging from the top 1% to the top 99% showing the percentage of PPIs that share the same sub-cellular localization and function, as well as the FSWeight cut off value. AtPIN web interface was entirely built as a PERL script and locally hosted on a DELL Poweredge server at http://bioinfo.esalq.usp.br/atpin/. A TAIR locus name can be used to query AtPIN and the response page displays all interactions found in AtPINDB, as well as the C3 value, PEP, and optionally, subcellular location information and gene ontology. The queried interactions may be visualized and manipulated online using Medusa JAVA applet , alternatively, the PPI network may be exported as an XGMML file to be visualized by Cytoscape. The edges shape and width indicate protein-protein interaction on the exported network, (figure 1). The thin-dashed line represents a predicted interaction and the bold line represents an experimentally-demonstrated interaction. The SIF file only represents the PPIs with no additional information. The RSP31 RNA binding protein, locus AT3G61860, was used as an example in the assembly of all the interactions in the AtPINDB. The analysis shows that RSP31 RNA binding protein interacts with nine distinct proteins, six of them being experimentally detected (Figure 1). Protein-protein interaction network generated by AtPIN export feature. Arabidopsis thaliana AT3G61860 interactome through AtPIN database. The arrow thickness indicates the evidence: thin dashed line represents that it is indirect evidence and in the case of the solid thick lines it represents direct evidence. We present two study cases, first encompassing the aminoacyl-tRNA synthetases (aaRS), a de novo experiment, and, a second found in literature, using the phytochromes proteins. The aaRS perform a crucial role in the maintenance of genetic code fidelity in all organisms. These proteins are required for catalyzing the joining of specific amino acids to their cognate tRNAs . aaRS have been shown to be involved not only in protein synthesis but also in transcription, splicing, inflammation, angiogenesis and apoptosis . Thus, the identification of aaRS-partner proteins may help elucidating their role in plant cells, one of our current research interests. In order to identify target proteins of A. thaliana cytosolic glutamyl-tRNA synthetase (gluRS) (locus AT5G26710) we combined two experimental approaches. First, analysis of the AtPIN database identified 45 candidate proteins, all of the interactions proposed by prediction analyses (Table 1). To confirm interaction of gluRS with the target proteins we performed a yeast two-hybrid system screening using At5 g26710 as a bait. Among twenty clones sequenced, the great majority was out of frame, indicating that these were false-positives. Only three sequences were in correct frame and were also found at AtPINDB (Figure 2): glutamine synthetase (AT5G35630), a zinc finger protein (AT5G24930), and a disease resistance protein (AT3G50950). 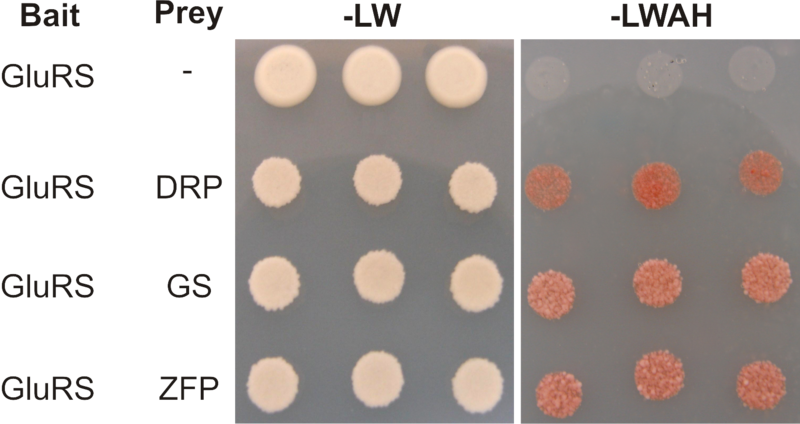 Bold: PPI confirmed in the yeast two-hybrid system. Yeast two-hybrid confirmation of a predicted interaction. AtGluRS interacts with a disease resistance protein (DRP), glutamine synthetase (GS) and a zinc finger protein (ZFP). 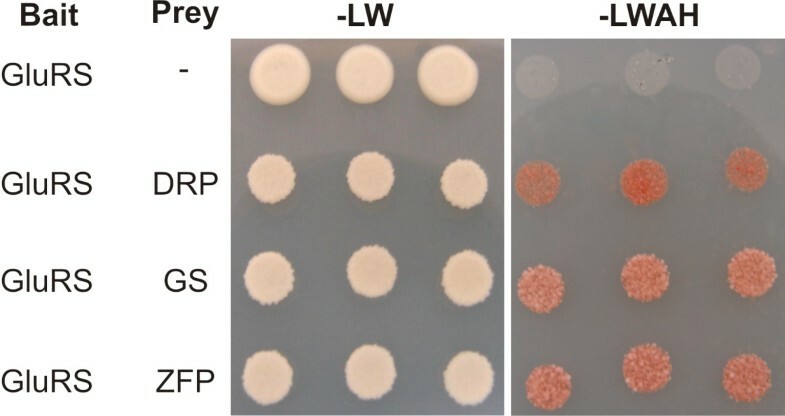 Three independent AH109 transformants were spotted onto yeast minimal plates lacking leucine and tryptophan (-LW) to select for the prey and bait plasmids respectively, or lacking histidine and adenine (-LWAH) to indicate reporter gene activation. Assays use a Gal4 based yeast two-hybrid system. Phytochromes are dimeric chromoproteins that regulate plant responses to red (R) and far-red (FR) light. Recently, Clark and co-authors  characterized the dimerization specificities of the Arabidopsis phytochromes in yeast two-hybrid analyses and by coimmunoprecipitation (co-IP), and demonstrated that two phytochrome forms, phyC (AT5G35840) and phyE (AT4G18130), do not homodimerize and, instead, heterodimerize with phyB (AT2G18790) and phyD (AT4G16250). Interestingly, the phyE heterodimeriziation with phyD was previously predicted by two different data sets present in AtPINDB and no homodimerization were predicted. This observation shows that AtPIN might be a useful, additive and reliable strategy to map protein-protein interactions in Arabidopsis, once it integrates a wide range of PPIs from different sources. AtPIN is a user-friendly tool to aggregate information on Arabidopsis thaliana PPIs, ontology, and subcellular localization. This database may help in elucidating the intricate network of A. thaliana protein interactions. The AtPIN usability is aimed at new researchers as well as more skilled personnel. The XGMML and SIF file generation may help in the construction of more complex PPI networks with no previous computer language knowledge since these files can be easily merged and edited. The AtPIN web server is publically accessible via Http://bioinfo.esalq.usp.br/atpin. To take full advantage of the AtPIN system, a user's web browser should support AJAX and JAVA. All data downloaded from the AtPIN server are tab-delimited ASCII format. The authors are grateful for the helpful comments of an associate editor and anonymous referees. We thank Prof. Yang Zhang for critical discussion on AtPIN and to Prof. Antonio Augusto Franco Garcia for statistical discussion during AtPIN production. To Christine Stock for critical reading of this manuscript, Raj Ackbul for help on debug Perl scripts and MySQL. Funding: This work was supported by grants from CNPq (151048/2007-0) and FAPESP (05/54618-9), Brazil. M.M.B. is a post-doc fellow funded by CNPq. L.L.B.D. has a graduate scholarship from CNPq. M.C.S.F. is also a research fellow of CNPq. MMB planned, wrote and tested all the software. LLBD performed all yeast two-hybrid experiments. MCSF provided guidance during all phases of planning, designing, testing and implementing AtPIN. All authors contributed to the writing of the manuscript.